The Paxette cameras are a line of viewfinder and rangefinder cameras made by the Braun company in Nuremberg, Germany in the 1950s. These cameras are of high quality, with excellent optics. 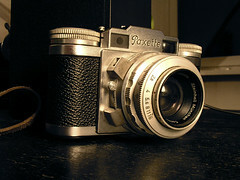 Even the viewfinder models (most of the Paxette I models) may be mistaken for rangefinder cameras, as they have a second window in an appropriate place, which is however an extinction meter. The Paxette II and Super Paxette II models have interchangeable lenses. 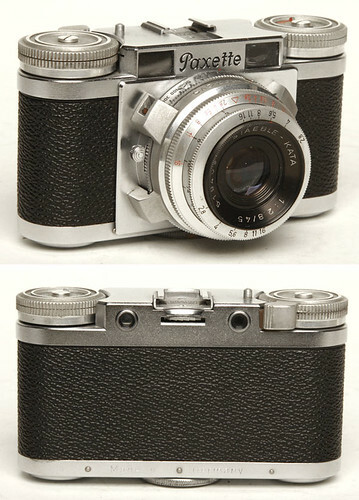 The lenses use an M39 thread mount; however, the cameras have a longer lens register than Leica cameras, largely because they use leaf shutters (of the Prontor family) rather than focal plane shutters, so the lenses are not interchangeable between Paxettes and Leicas. 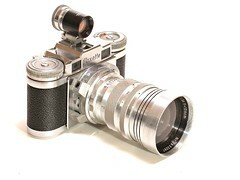 Not all early Paxette lenses are rangefinder coupled. Lenses were made for the Paxettes by several noted lens manufacturers, in lengths from 35mm (moderate wide angle) to 200mm (telephoto). 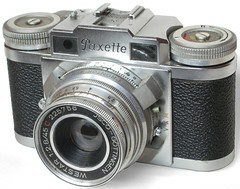 The Super Paxette line, introduced in 1956, are coupled rangefinder cameras; some models even have a coupled selenium meter. 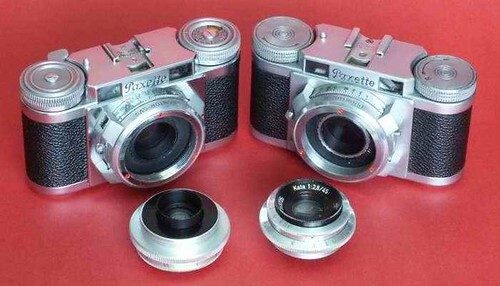 There are also Paxette Reflex SLR models. ↑ McKeown, James M. and Joan C. McKeown's Price Guide to Antique and Classic Cameras, 12th Edition, 2005-2006. USA, Centennial Photo Service, 2004. ISBN 0-931838-40-1 (hardcover). ISBN 0-931838-41-X (softcover). p152. 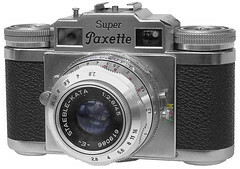 Super Paxette 1b review and cleaning instructions on Dominic's Classic Cameras. This page was last edited on 28 November 2017, at 11:32.